27th August 2010 marks the 20th anniversary of Stevie Ray's passing. Up for your perusal is a Mike Landau owned Blankenship Fat Boy Supreme with Sour Cream option -- a 6-position bright switch. 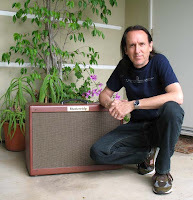 Unlike the stock Fat Boy Supremes which come with a single 15" speaker, this amp is outfitted with a pair of 12" Rola Celestion G12-65's which seem to be Mike's favorite. 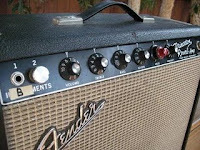 And to up the deliciousness factor, this particular amp comes in a rich chocolate-brown tweed. 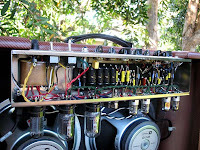 According to Blankenship's website, their Fat Boy amps allow the player to switch between a pair of 6V6 or 6L6 power tubes, without having to re-bias the amp. The Sour Cream option gives the customer a choice of either a Volume and 6-position bright switch or two dedicated Volumes, controlled by a footswitch. Past listings by the seller, LA Vintage Gear, also included a pristine 1967 Fender Twin, also owned by Mike, that was reworked by Roy Blankenship. Born 17th August 1954, Eric Johnson is 56 today! Bear in mind that I make no claim as to the accuracy or safety of the amp mod information on that site. 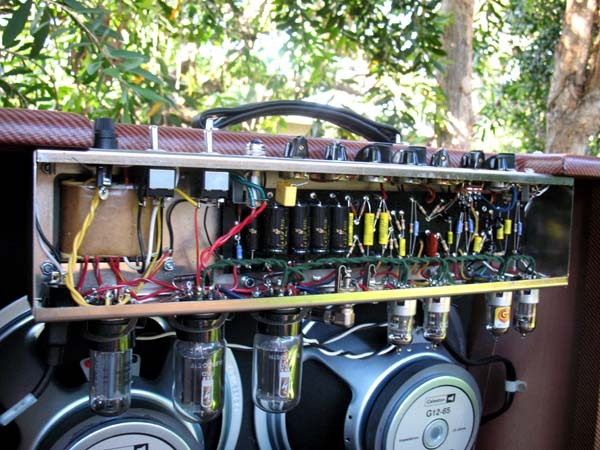 And make sure you know what you're doing before opening up any amp and poking around in there -- these kinds of mods are best left to a qualified technician. For those who can't bring themselves to fork out 15 bucks or more for a handmade Wegen pick, here's a vid showing how you can make your very own Gypsy jazz guitar pick. In true Gypsy jazz guitar tradition, the base material looks to be at least 3mm thick! Acetal plastic was used for the pick in this video, but for some downhome Gypsy authenticity, beef or hambone could also be used if you're so inclined. Respiratory masks are a must when making your own custom guitar picks!